Welcome to the 689th Edition of my series. Nothing much to report right now. I am glad this is the last week of January and will look to survive February. I will get on with my selections for the week. Paddington (2014): This is part three of my Nicole Kidman trilogy. Paul King directed this update to to a children's book series by Michael Bond. Paddington, voiced by Ben Whishaw, is a Peruvian bear who is in London searching for a home. He meets the Brown family, played by Hugh Bonneville, Sally Hawkins, Samuel Joslin, and Madeleine Harris, and is taken in but being told it is temporary. Things are looking up for Paddington but things change when he is targeted by museum taxidermist Millicent, played by Kidman, who is determined to stuff the rare bear. Geoffrey Palmer, Emelda Staunton, Michael Gambon, Matt Lucas, Julie Walters, Jude Wright, Kayvan Novak, Peter Capaldi, Jim Broadbent, and many others co-star. 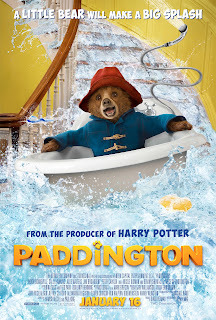 I have not read any of the books of Paddington but this is a pretty fun movie and seems to be a good way to reintroduce Paddington and have a resurgence on the books. 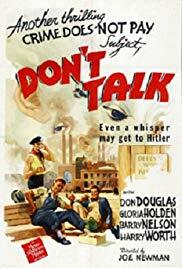 Don't Talk (1942): This is my short film for the week which is part of the "Crime Does Not Pay" series. This focuses on industrial sabotage during wartime where FBI agent Jack Sampson, played by Donald Douglas, investigates a shipment of manganese that blows up at a plant. Their investigation leads to waitress Beulah, played by Gloria Holden, who plays into the scheme. This one is a bit convoluted but still of interest. I always enjoyed this series and this particular one is available on Youtube. 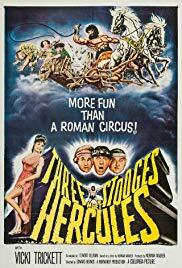 The Three Stooges Meet Hercules (1962): This is a much later work from the comedy trio and one of their very few feature length films which were in this era. Our stooges for this movie are Moe, Larry, and Curly Joe, played by Moe Howard, Larry Fine, and Joe DeRita. The first two are the originals but I understand Curly Joe was brought in for the feature length movies. The stooges work for a drug store where their inventor friend Schuyler, played by Quinn Redeker, manages to invent a time machine and things go awry when they get it to work but takes them to ancient Greece and meet the tyrannical King Odius, played by George Neise, and a young Hercules, played by Samson Burke. Vicki Trickett, Hal Smith, John Cliff, and many others co-star in this comedy. I don't think I need to into too many details of the plot. I thought this was a pretty funny feature from the Stooges after them doing years of short films. I usually enjoy comedies where a modern person ends up in an older era. Joe DeRita had some big shoes to fill and I'm sure he did not impress everyone but I thought he made the most of being a much later stooge. This is available on Amazon Prime. 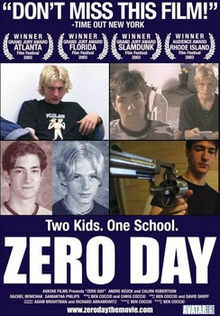 Zero Day (2003): Ben Coccio directed this film in which he co-wrote with his brother. Cal Robertson and Andre Keuck star as a couple of troubled high school students who tire of being made fun of and plan a school shooting. The movie is from a first person point of view where they are filming themselves in the plot with the intention of the video being found after the shooting. This is a very dark subject matter and probably not easy for some to watch. Some points of interest are that they point out the flaws of other shootings and let know that the parents are not to blame. This is very disturbing to watch but unfortunately rather realistic. This does have a good low-budget look having using a home camera that is being made by high school students. This could be something for parents to watch with their kids and then have a discussion on it afterwards. Nancy Drew...Reporter (1939): William Clemens directed this movie based on the famed detective character by written by a number of authors using the pseudonym Carolyn Keene. 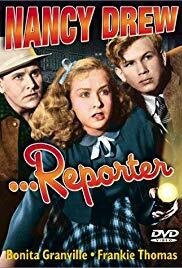 Bonita Granville stars as amateur sleuth Nancy Drew who is the reporter for the school newspaper and finds a real assignment that involves a murder. She does an investigation believing the accused is not guilty. John Litel, Frankie Thomas, Dickie Jones, Mary Lee, and many others co-star in this movie. I did not really know that the character of Nancy Drew went back so far but was first written 1930 and is a character that has lived on through many generations. This is a pretty good B-movie that is available on Hoopla. 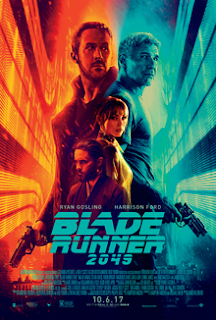 Blade Runner 2049 (2017): Denis Villeneuve directed this sequel that takes place 30 years after the first movie. Ryan Gosling stars as the new blade runner officer K who unearths a long buried secret that can plunge what is left of society into chaos. K decides to track down the missing Rick Deckard, reprised by Harrison Ford, to find more answers. Robin Wright, Edward James Olmos, Mark Arnold, Ana de Armas, Dave Bautista, Jared Leto, Sylvia Hoeks, Mackenzie Davis, Lennie James, Barkhad Abdi, Sean Young, and many others co-star in this sci-fi film. Former WWE champion Batista has a small but very compelling scene at the beginning. This is not a real action packed sci-fi movie but more of a psychological one. It will be good to start with the first one and this is not a rehash sequel. This does require some attention in order to keep up with the story. 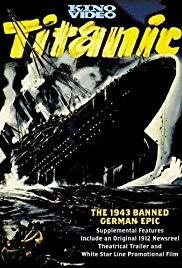 Titanic (1943): Obviously the most known version is James Cameron's blockbuster from 1997 and another pretty well known version is the one in 1953. This is a German film and one commissioned by Nazi Propaganda Minister Joseph Goebbels. This has the usual sort of storyline with fictional characters and subplots as well as true events leading to the sinking. This makes the Germans to be the heroes and the sinking of the titanic being the fault of British and American capitalism. One point of interest is the the director credited in Herbert Selpin who was arrested during filming for speaking out against the Nazi regime and found hanged in prison the next day. Werner Klingler was the second director that was never credited for this movie. This is interesting to watch for historical purposes and is still a compelling watch. Pina (2011): This is my documentary for the week which was directed by Wim Wenders. 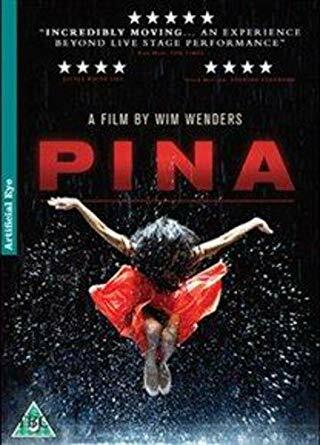 This is more of a tribute to the late German choreographer Pina Bausch than a documentary. Much of her dancers reenact her dance numbers and reflect on the times they had with Pina. It is hard to go into much more detail about this movie but is pretty well done with the unusual dance numbers. Wenders is probably most known for WINGS OF DESIRE but is very versatile and shows with this film. 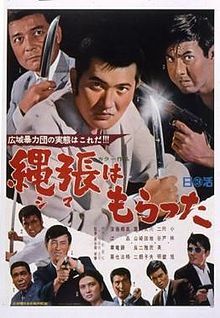 Retaliation (1968): This is my Japanese gangster film for the week which was directed by Yasuharu Hasebe. Jiro is just getting out of prison and the gang he was part of was mostly disbanded except for the aging boss who remains sick in bed. Jiro is offered a job to settle a dispute over two rival gangs and promised control over the land if he succeeds. The promise is broken and Jiro is driven to desperate measures. This is a rather complicated story but still of interest being an early Japanese gangster film. I don't believe they were ever referred to as Yakuza so not sure how that works. This is available to watch on Amazon Prime. 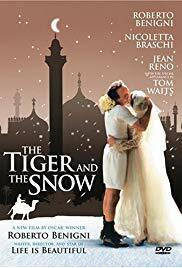 The Tiger and the Snow (2005): I see I'm on a streak of foreign films and end with this Italian film which is co-written and directed by Roberto Benigni. Benigni also stars as Attilio de Giovanni who teaches poetry in Italy. He has an unrequited love towards Vittoria, played by Nicoletta Braschi, who travels to Iraq with their friend Fuad, played by Jean Reno, during the second Gulf War and getting injured and comatose in the process. Attilio goes to Iraq putting his life on the line and doing what he can to save her. Tom Waits, Emilia Fox, Giuseppe Battiston, and many others co-star in this film. Waits plays himself in a rather amusing cameo. Benigni is likely most known for his movie LIFE IS BEAUTIFUL which is centered around the holocaust and more than anything is a drama that has a lot of comedy because Benigni is a funny person making the the most of a horrid situation. This one is no different and is a very moving story about love more than anything. 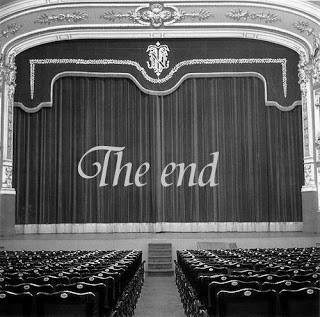 Well, that is it for this week but I do have "Movie Time in the Town of Pottersville". 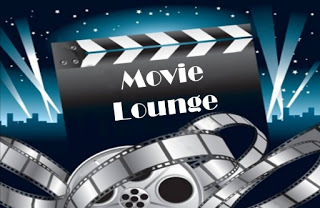 Tell me what you like and dislike and stay tuned for next week which so far includes Steve Carell, Julianne Moore, Carole Lombard, Treat Williams, and many others. 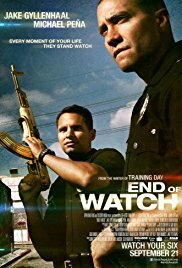 End of Watch (2012): I watched this on Friday when I went to go hang out with Stephanie and she presented me with this movie that she has on DVD which I had not seen so I went along. David Ayer wrote and directed this film which is shot in a documentary style. Jake Gyllenhaal and Michael Pena star as L.A. cops Brian Taylor and Mike Zavala who are partners and friends. They have themselves filmed on their times on the job and in their personal lives much to the dismay of their colleagues. Natalie Martinez, Anna Kendrick, David Harbour, Frank Grillo, America Ferrera, and many others co-star in this film. This is this a very rough and gritty film that is not for everyone. Gyllenhaal and Pena work very well together. It is a really good look about a couple cops trying to get through their shift in having to see such horrific things and maintaining their sanity.